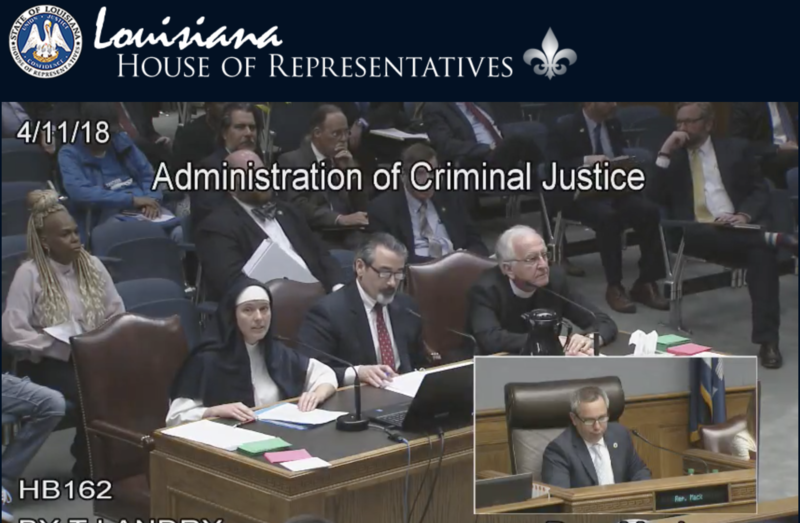 The Louisiana House of Representatives Committee on the Administration of Justice hears testimony on HB 162 on April 11, 2018. The bill, which would have abolished the state's death penalty, failed by one vote in the committee. 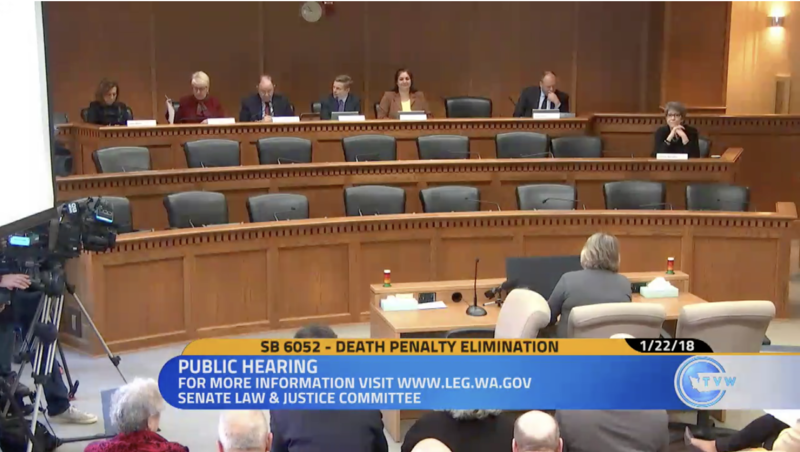 The Washington Senate Law and Justice Committee hears testimony on SB 6052, to abolish the state's death penalty, on January 22, 2018. The bill passed in the Senate and a House Committee, but was not voted on by the full House prior to adjournment of the legislative session. 1. SB272 would authorize executions by nitrogen hypoxia if lethal injection is unavailable or found to be unconstitutional and would give a death-sentenced prisoner one opportunity to choose to be executed by nitrogen hypoxia or the electric chair, so long as he or she designates the method of execution within 30 days of the Alabama Supreme Court's affirmance of the sentence of death imposed in the case. If the prisoner does not designate a method of execution, the default method of execution remains lethal injection. 2. SB118 would establish procedures for determining if death-penalty defendants have intellectual disability. 3. SB119 would prohibit the imposition of a death sentence on anyone younger than 18 at the time of the crime, bringing Alabama law into agreement with Roper v. Simmons (2005). 4. SB106 would retroactively apply the 2017 law that ended the ability of judges to override jury verdicts in death-penalty cases. 5. SB104 would repeal the death penalty. 6. SB103 would place a moratorium on the death penalty for a period of three years until certain procedures are implemented to ensure that death penalty cases are administered fairly and impartially. 1. Introduced and referred to Senate Judiciary Committee on January 9, 2018. The committee approved the bill by a vote of 11-1 on February 14, 2018. The bill PASSED the Senate on February 22 by a vote of 29-0. PASSED the House on March 20 by a vote of 75-23. SIGNED into law by Governor Kay Ivey on March 22, 2018. AB 1443 was introduced on February 17, 2017. On March 13, 2017 it was referred to the Assembly Judiciary Committee and the Assembly Committee on Public Safety, where it was unanimously approved. On May 18, 2017 the bill unanimously PASSED THE ASSEMBLY by a vote of 69-0. On June 1, 2017 the bill was referred to the Senate Judiciary Committee, where it unanimously passed (6-0) on June 28, 2017. On July 20, 2017 the bill unanimously PASSED THE SENATE by a vote of 38-0. The bill was SIGNED INTO LAW by Governor Jerry Brown on August 7, 2017. HB 125 would reinstate the death penalty for murder or accomplice murder with 22 aggravating circumstances. The bill was introduced and referred to the House Judiciary Committee on April 4. It was approved by the Committee on May 3 and sent to the full House. It PASSED THE HOUSE on May 9 by a vote of 24-16. 1. SB870 would apply Hurst v. Florida to all death penalty cases, not just those that became final after June 24, 2002. 2. SB1416 would abolish the death penalty. 1. Filed November 14, 2017 and referred to the Senate Criminal Justice Committee on November 29. It was on the committee's agenda on January 9, 2018, but not considered. It was considered and PASSED by the committee by a vote of 3-2 on February 6, 2018, then referred to the Senate Rules Committee. 2. Filed January 2, 2018 and referred to the Senate Criminal Justice; Judiciary; and Rules Committees on January 12. 1. Senate File 335 would reinstate the death penalty for offenses in which a minor is kidnapped, raped, and murdered. 2. House Study Bill 569 would reinstate the death penalty for murder in the first degree. 1. Introduced and referred to the Senate Judiciary Committee on February 23, 2017. The bill advanced out of a subcommittee by a 3-2 vote on February 12, 2018, but on February 13 was PULLED FROM CONSIDERATION by the Committee chairman. 2. Introduced and referred to House subcommittee on Public Safety on January 23, 2018. After a subcommittee hearing, the bill passed a public safety subcommittee, but proponents of the measure indicated they did not have sufficient support to move forward with the bill in committee. The bill, sponsored by 8 Republicans and 7 Democrats, was introduced on January 25, 2017 and referred to the House Committee on Corrections and Juvenile Justice. A hearing was held on the bill on February 13, 2017. 1. SB54 and HB155 would abolish the death penalty. 2. SB107 would exempt persons with severe mental illness from the death penalty. 3. HB316 would make the murder of a victim aged 12 years old or younger or a mentally or physically dysfunctioning adult in need of protective services an aggravating circumstance. 1. SB54 referred to Judiciary Committee on Jan. 4, 2018. 2. SB107 was introduced on January 23, 2018. The bill was amended in committee on March 1 to remove Posttraumatic Stress Disorder from the list of conditions that would bar application of the death penalty against severely mentally ill individuals. The bill was favorably reported out of committee, as amended, but recommitted to the Judiciary Committee on March 15. 3. HB316 was introducedon February 6, 2018 and referred to the House Judiciary Committee. SB51 was Prefiled on February 21, 2018 and provisionally referred to the Senate Judiciary Committee. The bill passed the committee by a vote of 4-1 on April 10, 2018. HB162 was referred to the House Committee on the Administration of Criminal Justice, which held a hearing and voted 10-8 to defeat the bill on April 11, 2018. 2. SB1081 and HB2509 would prohibit imposing the death penalty upon a person who was suffering from a serious mental illness at the time of the offense. 2. SB1081 was introduced on March 1, 2018 and referred to the Senate General Laws Committee. A hearing on the bill is scheduled for April 11, 2018. HB2509 was introduced on February 20, 2018 and referred to the House Committee on Health and Mental Health Policy on March 5. A hearing on the bill is scheduled for April 11, 2018. 1. The death penalty abolition bill was introduced on January 17, 2017 and referred to the Judiciary Committee on January 19, 2017. The Committee conducted a hearing on the bill on March 22, 2017. 2. The execution secrecy bill was introduced with 11 sponsors on January 18, 2017 and referred to the Government, Military and Veterans Affairs Committee. A motion to instead refer it to the Judiciary Committee failed and the bill is scheduled for a hearing in the Government committee February 9, 2017. 1. HB351 would expand the death penalty to include knowingly causing the death of a person who is less than 18 years of age. 2. SB593 would abolish the death penalty and replace it with a maximum penalty of life without parole. 1. The bill was introduced on January 5, 2017 and referred to the House Criminal Justice and Public Safety Committee. The Committee held a hearing on the bill on February 7, 2017. On March 1, 2017, the committee deemed the bill "inexpedient to legislate" by a vote of 17-3. On March 8, 2017, the full House upheld the committee decision and REJECTED THE BILL by a vote of 305-46. 2. Introduced on February 15, 2018 and referred to Judiciary Committee. The committee conducted a hearing on the bill on March 12, 2018 and recommended by a vote of 3-1 that the bill "ought to pass." The bill PASSED the full Senate on March 15, 2018 by a vote of 14-10 and moved to the House. SB593 was referred to the House Criminal Justice and Public Safety Committee, which held a hearing on the bill on April 4. On April 26, the committee recommended by a vote of 12-6 that the bill "ought to pass," and it PASSED the full House that day by a vote of 223-116. Governor Chris Sununu vetoed the bill on June 21. On September 13, the Senate voted 14-10 to override the veto, falling two votes short of the two-thirds supermajority necessary for an override. 1. HB38, which has 14 co-sponsors, was introduced on February 7, 2017 and referred to the House Criminal Justice Committee, where it received a hearing on February 21, 2017. On May 17, 2017, the bill was favorably reported out of committee by a vote of 11-0. On May 17, 2017, it PASSED THE HOUSE by a vote of 96-0. On May 18, 2017, the bill was introduced in the Senate and referred to the Senate Judiciary Committee on May 24, 2017. 2. SB12 was introduced on January 31, 2017 with 2 co-sponsors and referred to the Senate Judiciary Committee on February 1, 2017. 3. SB40 was introduced with two sponsors and 7 co-sponsors on February 8, 2017. It was referred to the Senate Judiciary Committee on February 15, 2017. The committee has held three hearings on the bill. HB81 was introduced with two sponsors and 11 co-sponsors on February 22, 2017. It was referred to the House Criminal Justice Committee on February 28, 2017. The committee held six hearings on the bill between March 7, 2017 and December 4, 2018, when the committee voted 9-3 in favor of passing the bill. A vote in the full House is expected in early December. 4. SB94 was introduced on March 7, 2017 and referred to the Senate Judiciary Committee on March 15, 2017. HB389 was introduced on October 23, 2017 and referred to the House Criminal Justice Committee on October 31, 2017. The bill was introduced on January 19, 2017 and was referred to the House Judiciary - Criminal Justice and Corrections Committee on February 7, 2017. The Committee substituted a new version of the bill on February 9, 2017, which passed the Committee that day by a vote of 10-1. The Committee substitute PASSED THE HOUSE by a vote of 74-22 on February 16, 2017. The bill was referred to the Senate Judiciary Committee on March 20, 2017. SB703 was introduced on May 8, 2017 and referred to the Senate Judiciary Committee. HB1466 was introduced on May 31, 2017 and referred to the House Judiciary Committee. H5208 was introduced on January 26, 2017 and referred to the House Judiciary Committee. 1. SB871 would make confidential any identifying information about the execution team, including suppliers of lethal-injection drugs. 2. SB872 would make electrocution the default method of execution. Death-row prisoners would be offered the option of lethal injection if it is available. 1. SB 871 was introduced on January 9, 2018 and referred to the Senate Committee on Corrections and Penology. Favorably referred out of committee on February 6. 2. SB872 was introduced on January 9, 2018 and referred to the Senate Committee on Corrections and Penology. Favorably referred out of committee with amendment on February 6. The amended bill PASSED the Senate by a vote of 26-12 on March 6. SB872 was sent to the House on March 7 and referred to the House Judiciary Committee on March 8. HB1123 would exempt from the death penalty persons with severe mental illness. HB1123 was introduced on January 23, 2018 and referred to the House State Affairs Committee. The committee held a hearing on the bill on January 31, 2018, amended the bill, and voted 9-4 in favor of passage as amended. The bill PASSED THE HOUSE OF REPRESENTATIVES on February 2, 2018, but was tabled by a vote of 5-2 in the Senate Judiciary Committee on February 20. 1. HB7 and& SB27 would provide for automatic direct review by the Tennessee supreme court of& capital convictions and death sentences and removes an intermediate level of direct appeal to the court of criminal appeals in death penalty cases. 1. HB7 was filed for introduction January 5, 2017 and officially introduced on January 10, 2017. It was referred to the House Criminal Justice Committee on January 12, 2017 and assigned to the the Subcommittee on Criminal Justice on January 24, 2017. It was placed on the subcommittee's calendar for February 7, 2017. SB27 was filed for introduction on January 11, 2017 and officially introduced on January 12, 2017. It was referred to the Senate Judiciary Committee and placed on the calendar for February 7, 2017. 2. HB345 was filed for introduction on February 1, 2017 and officially introduced on February 2, 2017. It was referred to the House Criminal Justice Committee on February 6, 2017 and assigned to the Criminal Justice Subcommittee on February 7, 2017. SB378 was filed for introduction on February 2, 2017. It was referred to the Senate Judiciary Committee on February 8, 2017. 1. HB379 would prospectively repeal Utah's death penalty. 2. HB70 would direct the Legislative Auditor General to conduct an audit of the comparative costs of the death penalty capital offenses and nondeath penalty capital cases. 3. SB30 would expand the death penalty to add as an aggravating circumstance the killings of correctional officers, special function officers, search and rescue personnel, emergency medical personnel, ambulance personnel, and security officers; and clarify that all peace officers and emergency responders as defined in Utah Code are also to be designated as potential victims of aggravated murder. 1. Introduced February 13, 2018 and referred to the House Judiciary Committee. Favorably reported out of committee by a vote of 7-4 on February 22. Subsequently withdrawn from consideration. 3. Introduced on January 22, 2018. Senate Judiciary, Law Enforcement, and Criminal Justice Committee gave it a favorable recommendation (5-1 vote, with one absent) on January 29, 2018. 1. HB758 referred to Committee for Courts of Justice on January 9, 2018. SB802 referred to Committee for Courts of Justice on January 10, 2018. SB802 was passed by indefinitely on January 17, 2018, meaning that the committee may reconsider the bill at a later date. 2. HB762 referred to Committee on Appropriations on January 9, 2018. SB772 referred to Committee on Finance on January 10, 2018. 1. 2017 legislative session bills HB1935 and SB5354 would prospectively repeal the death penalty. 2. SB6052 would prospectively repeal the death penalty. 1. HB1935 was introduced on February 3, 2017 and referred to the House Committee on Judiciary. The bill had a hearing, but no vote was taken during any of the 2017 legislative sessions and, by resolution, it was "reintroduced and retained in present status" on January 8, 2017. SB5354 was introduced on January 20 by 12 Senators "by request of Attorney General" and referred to the Senate Committee on Law & Justice. No action was taken on the bill during any of the 2017 legislative sessions and, by resolution, it was "reintroduced and retained in present status" on January 8, 2017. 2. SB6052 was prefiled for introduction on December 22, 2017 and referred to the Senate Law & Justice Committee on January 8, 2018. A public hearing was conducted on January 22. The bill PASSED THE SENATE by a vote of 26-22 on February 14. The House Judiciary Committee held a hearing on the bill on February 20. The committee voted 7-6 on February 22 to advance the bill to the full House with a "do pass" recommendation. NOTE: On October 11, 2018, the Washington Supreme Court declared the state's death penalty statute unconstitutional, saying that it was applied in an arbitrary and racially discriminatory manner. 1. HR 115 (the "Thin Blue Line Act") would expand the federal death penalty to make the killing of state and local police officers an aggravating circumstance. 2. HR 4493/S 2389 ("Eric's Law") would permit a second death-sentencing hearing before a new jury in the event of a non-unanimous sentencing decision in the first death-penalty trial. 1. The bill was introduced in the U.S. House of Representatives on January 3, 2017 and referred tp the House Judiciary Committee. The Committee advanced the bill on April 27, 2017 by a vote of 19-12. The House of Representatives PASSED the bill by a vote of 271-143 on May 18, 2017. 2. HR 4493 introduced in the House on November 30, 2017, referred to the Judiciary Committee. S. 2389 introduced on February 7, 2018.